EcoHeat S Reviews - Is it a Scam or Legit? The EcoHeat S utilizes a ceramic heating element, a fan and a thermostat to provide-climate controlled heating for rooms of up to 120 square feet. EcoHeat S is a cylinder-style heater with an adjustable thermostat and oscillation that can heat an area to a maximum of 98 degrees. The heater uses ceramic heating elements and an internal fan to push hot air out into the room in which it stands. According to the heater’s website it can produce heat in as little as three seconds. During the winter months, heaters like these can be a lifesaver for homeowners and renters who want to save on electricity bills by heating one room and not the whole dwelling. The heater is part of the product lineup of Hyperstech, a company who sells items we’ve reviewed like the DroneX Pro. In this review, we’ll analyze how the heater works, how much it costs and talk about whether or not a heater of this size can heat a standard 100-square foot room. 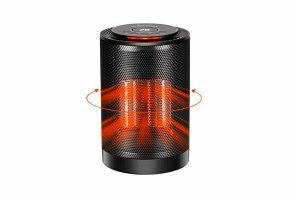 We’ll also compare it to other heaters we’ve reviewed. The EcoHeat S is made up of three key parts: the heater, the fan and the control panel. According to the company, the EcoHeat’s heating module has a certain amount of ceramic in it. The fact that the heating element has ceramic in it is a testament to ceramic’s popularity with small heaters of this type. The reason ceramic is popular among these small heaters is that ceramic is excellent at absorbing and releasing heat, which means they can push a lot of heat out into a room pretty quickly and, when you turn off the heater, it will cool down quickly. The site goes on to mention ceramic heaters are between 85- and 90-percent efficient, which means they don’t waste a lot of energy. The EcoHeat S has two wattage settings: 1,220 and 600. It takes 10 watts to warm a 10-square-foot room, which means this heater can heat rooms between 60 and 120 square feet. The heater’s fan is what blows the heat into the room. You have the option of making the fan oscillate 70 degrees (35 degrees to the left, 35 degrees to the right) so that the heat is spread evenly over the space in front of the heater. The control panel located on top of the heater is where you’ll set the thermostat, turn on the oscillation and change the heat intensity of the unit. For example, you can choose to use high heat, low heat or just use the fan. You can also set the thermostat to temperatures of up to 98 degrees. A small screen on top of the heater displays the current temperature and, when you’re adjusting the thermostat, it will show your heat setting. As we mentioned a few seconds ago, you can press a button to turn on the oscillation, too. The heater stands at 8.3 inches tall and 5.5 inches wide. At the time of publishing, the EcoHeat S was listed at $89. This price included a 50% discount as well as free shipping. The good news is that your price drops drastically when you buy these heaters in bulk. At $227 for five heaters, you’re paying around $55 instead of $89. According to the heater’s website, delivery of the item or items will take between five and seven days. Your heater comes with a pair of protections in the event that you’re not happy with your heater or it breaks under normal use. First, you have 30 days to return your item if you aren’t happy with it. According to the fine print, you can only return the heater if it is damaged or defective. To do so, email support@hyperstech.com, to obtain a return material authorization number. You’ll have to write this on the shipping box itself and the paperwork you include inside the box. They will not process a return without this number. Also, you’ll have to pay for shipping. Understanding how good of a deal a product is can be tough if you don’t know what competing items cost. At HighYa, we’ve had the chance to review other compact heaters; namely, Handy Heater and the Sunshine Blade. Based on our research, we believe that the EcoHeat could be a good option for you if you’re looking for a small heater to warm up a room. That being said, we believe that there are better values out there on heaters that can do the same job. For example, a Mainstays 1500W fan heater from Walmart can warm a 150-square-foot room and cost $12.86 at the time of publishing. Based on the calculations we talked about earlier, that’s more than 10 heated square feet per dollar spent on the heater. The drawback to this heater, though, is that there is no thermostat. So, if you want to use the heater in a baby’s room and make sure the room doesn’t get too hot, then a heater with a thermostat would be the right choice. This scenario reveals one of the key values of the EcoHeat S: the thermostat. However, there are plenty of cheaper heaters with thermostats on the Walmart website for less than $50. In general, we think that all the features the EcoHeat S offers are excellent and necessary if you want a versatile heater. That being said, we think that, unless you buy five heaters to get the deeper discount, there may be better values out there. I purchased two heaters as advertised on the M.S.N. webpage. On opening the box, I saw that the voltage was 220 volts and the power plug was the type as used in U.K. Two round pins. I have tried to find a suitable converter to use with this item with no success. I am wondering how many people are having this problem and what they are doing to solve it? These heaters are being sold into the UK with 2 prong Euro plugs. Adapters are not supplied and you are told to "go buy one locally." This is unacceptable. Do not buy one if you live in the UK. They are not suitable. I sent for this heater on what appeared to be a UK website...it cost me £71.00 via PayPal. It eventually arrived in a box that was marked China post...It had a 2 pin plug, which is no use in the UK. I contacted the seller who it transpires is based in Estonia. They wanted it returned at my expense before refunding my money. PayPal it seems is on the side of the seller in this case...they told me to send it back, tracked to Estonia, £20 plus! So I must risk losing close on £100.00? Who knows if they would have denied receiving it? It’s going to the rubbish tin...too dangerous to take to the charity shop! This is hilarious as I have a similar experience. I received the EcoHeat S, which is configured for Europe, having the electrical plug for 220V, which is useless in Canada as we have 120V 60 cycle which uses 2 prongs or 3 prongs (one ground). I have made many attempts to contact the company on several occasions only to be told that they are investigating and will contact me. I don't think they know anything. I received my EcoHeat S, it is wired UK 240v50~, we use 120v60~, so for this heater to function I'd have to buy a transformer costing much more than the heater. What now? As for recommending to others, no, unless it can be guaranteed the heater is wired for our North American electrical system. This product is being dumped on North American consumers by an unscrupulous company in Estonia that masquerades as a legitimate marketer. These are Chinese made products with a 220-volt plugin that cannot be plugged in in North America. The company knows this and has admitted that this is the product they sell. They do not sell heaters that can be plugged in in North America. The company's response is to tell the unhappy purchaser that they need to buy a converter to convert the power. These are expensive. Alternatively, they tell you to mail it back to Estonia, even though this is not where it came from and postage there is as high as the product cost in the first place. Our issue with this heater is the same as all above. We purchased one heater. We live in Canada in Ontario. The parcel was shipped a 40-minute drive from us, you would think they would know which kind of electrical equipment to supply. Nobody is answering emails. When I ordered two heaters. The website put up a pop-up box asking me to pay an extra €24 per heater for an assortment of functions, which I had initially believed should have been included because they were the main selling points described in the advert. There was no way to get rid of the pop-up box without going forward with the order. I made the decision to check the boxes so I could move to the next step where I fully expected to be offered the opportunity to review my order before either canceling or confirming the purchase. However, this was not the case, after clicking on the pop-up box the next page merely confirmed that I had placed an order. I immediately messaged the helpline regarding this problem, but by the next day I hadn’t had any response, so I telephoned the helpline number where I spoke to an operator who told me his name was Dave. I explained the issue with being charged extra for what was advertised as standard in the product. He informed me that without these extras the product would not work as described. I said I had believed they were advertised as included and unless the price could be reduced to the advertised selling price then I wished to cancel the order. He then informed me that the order had been dispatched so could no longer be canceled. Interestingly when checking the pop-up box I had only checked the LCD display function once. On arrival imagine my surprise to find that both heaters were equipped with fully operating LCD displays. Obviously this is a scam. I am now trying to return these for a full refund; it will be interesting to see if this is in fact possible. I ordered three of these heaters from their website December 28, 2018 and received them as expected about 10 business days. The units were shipped from Hong Kong, which is no big deal but just something to keep in mind as you’ll see in a bit. Upon opening the boxes, I found that each had an electric cord that had two cylindrical prongs (were meant for use in some other country and had an electrical requirement of 220/240v 50Hertz which is incompatible with our 120v 60Hertz here in the USA). So I contact their supposed award-winning customer service and was told that I should keep them and buy power inverters and they would give 5% discount, or I could return them to them in Estonia with tracking at my expense, which they refuse to refund, and they would credit me my original purchase price. Doing some research, the cost to return each of these heaters to this Balkan country from Uniontown, Ohio begins at $40. Mind you, I paid $187 for three. So they want me to spend $120 + to return these unusable heaters so they can credit me $187. I used PayPal but they refuse to pay shipping or refund my money unless items are shipped back to the seller. I’m thinking that this was no mistake on their part for as long as they furnish a product, whether usable or not, they know that the cost and hassle to return these items would likely equal or exceed the purchase price that is if they even have the shred of decency to finally issue a refund. PayPal is complicit in this, in my opinion, as they basically say ship it back with tracking information and we’ll follow up to see seller issues the credit once seller gets items back. Why I think this is a scam or fraud is that the seller never offered to exchange the heaters, which in my opinion they should do so at their expense, not mine. But nothing like that was ever offered. I waited almost two months for my desktop heater. I finally got it and it’s for a European plug outlet! This company NEVER EVER answers emails. I will NEVER order from them again! I want someone to take care of this right away, or I will tell every media outlet about their shabby customer service and what a scam company they are. Just so they know that I really bought it from them, my order number is d227f267abaacc. I ordered two of these and had it shipped to our home in Colorado. It took over a month for both of them to arrive. Very disappointed when they did arrive because they require 220 - 240V outlets. Nothing on the website said it required 220 -240V outlets. Converters are too much money, it's going back. Write a Review for EcoHeat S!